On the morning of Sept. 10, 2015, Jeremy Jacobs walked into a lawyer’s office in downtown Buffalo, prepared to be grilled for some seven hours about his ownership of the Boston Bruins. On at least two separate occasions in the days before his deposition, he had met with National Hockey League lawyers to prepare for questions about the league’s concussion lawsuit, according to a 350-page transcript of his deposition, one of 31 deposition records obtained by TSN. Shortly before a lunch break, a lawyer for the group of ex-NHLers suing the league asked Jacobs a direct question: Have you ever heard of the neurodegenerative disease known as CTE? A video camera recorded the exchange as Jacobs said he couldn’t recall reading about CTE or hearing it being discussed at any NHL meetings. Jacobs was later asked whether he was aware CTE, or chronic traumatic encephalopathy, had been found in the brains of former professional football players. “How about former professional hockey players?” a lawyer asked him. “I don’t think so. I don’t know,” Jacobs answered. It was a surprising response from the NHL Board of Governors chairman because, at the time of his deposition, CTE had been discovered posthumously in the brains of four former NHL players: Reggie Fleming, Rick Martin, Bob Probert and Steve Montador. Moreover, more than three years before Jacobs sat down for questioning, the NFL made front-page news around the country when it agreed to pay $765 million to settle its own concussion lawsuit, a legal battle that began in 2011 where CTE was also front and centre. 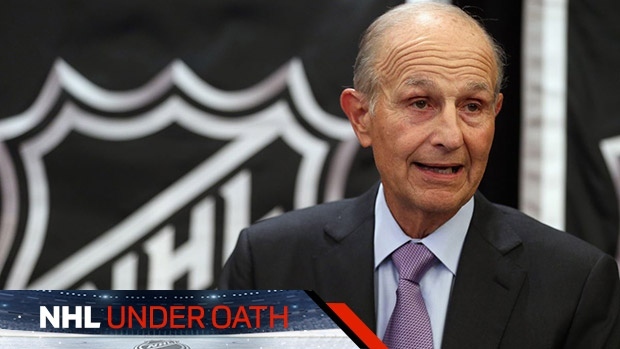 Jacobs, who bought the Bruins in 1975 and is now 78, was among five NHL owners who testified under oath about the league’s approach to repeated head trauma. Their depositions offer a glimpse into how hands-off they say they are when it comes to issues such as player health and safety, how they collectively oppose a prohibition on fighting and head hits, and how, even with the threat of a massive court judgment in the case, they say they know next to nothing about long-term neurological disorders such as CTE. Balsam said in an interview with TSN that the NHL has likely spent more than $50 million on legal fees so far for the case. She said it would be surprising and unusual for the NHL’s legal department to not brief team owners on what CTE is and how it might affect the NHL. The transcripts obtained by TSN are the sworn testimony of NHL team owners such as Jacobs, NHL commissioner Gary Bettman, other league officials, team trainers and doctors and medical consultants to the NHL and NHLPA, as well as former NHL players such as Brendan Shanahan, Colin Campbell and Kris King who later worked for the league and/or its teams. The depositions are redacted, meaning some of the most sensitive sections of testimony are still secret, blacked out unless a judge in the case rules that it’s in the public interest they be made public. The depositions of former players suing the NHL are completely redacted. - Daly testified he never asked former NHL Alumni Association president Mark Napier to forward emails ­– which Napier did – revealing how some former players were trying to recruit others to join the NHL concussion lawsuit. The NHL has been accused of collective willful blindness in the five-year-old concussion lawsuit that has polarized the hockey industry. Commissioners, team owners and league executives have allegedly snubbed science, plaintiffs lawyers say, ignoring studies published since at least the 1920s that have warned about the dangers of repeated concussions. Jacobs wasn’t the only NHL team owner who testified he was in the dark about CTE. He said that his knowledge of the disease was limited to what he had read in Sports Illustrated or perhaps The Wall Street Journal, and that he was aware that former NHL player Derek Boogaard had been posthumously diagnosed with CTE. Two weeks after Jacobs’ deposition, Los Angeles Kings owner Phil Anschutz was asked in a Sept. 29, 2015, deposition about his knowledge of the disease. Anschutz said he wasn’t aware of the term chronic traumatic encephalopathy or CTE. The billionaire entrepreneur said he couldn’t recall hearing it being discussed at any NHL meetings. After Anschutz testified that he had never heard the term Lou Gehrig’s disease, he was asked whether dementia and Alzheimer’s are serious medical conditions. “They appear to be,” he said. Mark Conrad, director of the sports business concentration at the Gabelli School of Business at Fordham University in New York, said he believes NHL owners have avoided learning anything about CTE and other neurocognitive diseases as a legal strategy. In his Dec. 17, 2015, deposition in Pittsburgh, Penguins owner Mario Lemieux was never asked directly if he knew what CTE is. But he was asked about his relationship with Sidney Crosby, the Penguins superstar who lived with Lemieux for eight years.